Give these short email min-E-courses a try. They are designed to give you marketing insight into various areas of your professional massage or chair massage practice. Each mini-E-course will provide you with a number of short easy to understand e-mail lessons delivered directly to your inbox. Each day for the period of up to a week you'll get valuable business information to move your massage business to the next level. There's no charge. You can cancel the lessons coming into your inbox at anytime. Your feedback is very important to us. Please send us a note containing your thoughts about the material presented. We look forward to hearing from you. 5-Day min-E-course: "Generate Quick Income and Build a Successful Massage Business with Retail Chair Massage"
Are you one of the many massage therapists or chair massage practitioners who are not meeting your financial goals? Do you need help Marketing Massage to finally create the business you dream about? Do you love providing massage, but cringe at the thought of making cold calls and selling? Did you learn about massage, but just not enough about launching and growing your massage business in ways you are comfortable with? We know from years of questions, that many people are just not comfortable with sales and marketing and don't know how to take action to meet their financial goals in ways they are comfortable with. Chair Massage Biz is here to help you with clear and precise steps to help you take action in order to be comfortable building your business with step-by-step marketing tools and processes that work. When you're ready to launch your business or it's time to jump up your massage therapy marketing and chair massage marketing one of the best, more efficient and cost effective ways to increase your cash and sales is to set up a Pop-Up Retail Massage Station. Retail massage stations can be set up virtually anywhere. We all know that almost everyone loves and wants massage. Who says 'go away, stop that' when someone puts their hands on a persons shoulders? We want you to go out there, take action and make money doing what you love to do-massage.  Find out why people are not running out to book their massage and how you can tempt them to try you out.  Find out where to meet the right people who are most inclined to call you first.  Find out the secrets to building relationships that build your business. We invite you to sign up for your free five-day min-E-course to help you get started making money by giving massages and increasing your direct marketing with massive exposure in environments you love to work in. The time to take action is now! Take a look at a sneak peak of what's in store for you. Marketing your Chair Massage Business and Massage Therapy Business does not have to cause you angst when we've done the work for you already! Why are people not banging down your door to book appointments and what you can do to get the word out in ways that are comfortable for you. Why massage is the ideal 'marketing tool' to help launch and grow your massage and chair massage business and how to use it effectively for marketing. Why choosing your target niche markets will help you grow your massage business and contacts. How to choose your target markets to make you more comfortable with sales and marketing. How to build, develop and utilize the characteristics that make people call you and who are happy to hear from you. Taking action with new information. Take advantage while this course is being offered at no charge. Sign up NOW for this FREE min-E-course. 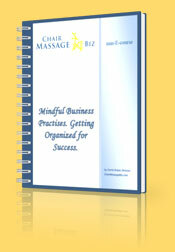 Every day for five days you will receive valuable information to help you launch or improve your massage business. Increase your clients with the only marketing system you will love that puts cash in your pocket. All while getting the word out and getting your hands on people! 5-Day min-E-course: "Mindful Business Practices  Getting Organized for Success"
Do you experience the absolute joy you get when you feel success every week? What's stopping you from reaching the heights you intended to have? Many Massage Professionals are experiencing frustration and stress which is caused by the day to day business practices we use that do not result in the success we had envisioned. Are you experiencing financial stresses? Are you seeking a better, more successful way to run your business and practice? Since 2001 my massage business has been a journey of discovery for me. It didn't take me long to realize that I was sabotaging my success. While I worked hard, I was frustrated and felt a lot of stress and disappointment. It took some soul searching and serious reflection to see that if I didn't change my habits, my business wouldn't change. In other words, if I kept doing things the same way I would keep having the same results. When my kids got older and my ill Dad passed, I had time to work on my business and myself. Over the last 6 years I studied myself and great business people, read dozens of books and altered the ways I run my business. I am happy to say my life and my business are thriving. We all develop habits that can hinder our success. Some of these habits are born out of a belief system, some are because of our fears and others are a result of our not being taught the best ways to organize our business life. Putting mindful intention into our daily routines keeps our lives organized and helps reduce our stress, leaving us more time to enjoy the fruits of our success. By learning successful ways and using them  emphasis on 'using them', I have learned how to get on track and stay on track, not becoming distracted, overly discouraged or frustrated. I know from the conversations and emails we receive that a great many Massage Professionals are experiencing the same or worse stress over their finances and a lack of success. Over the past few years I've heard the same fears, problems and frustrations from people all over the world. I've also questioned people to find out that their habits and thoughts are the primary cause of these problems. We may learn to give a great massage but many people have never been taught how to run a business. Helping people reach their potential and enjoy the fruits of success has always been a big force in my life. Over the past few months we've worked really hard to identify the issues and itemize the productive practices that change frustration into success. Running your business successfully means letting go of unproductive habits and developing and honing habits that help you work mindfully. The goal is to run your business, not let the business run your life! 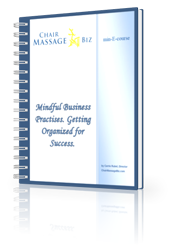 Mindful Business Practice: Getting Organized for Success 5-day min-e-course is a journey of discovery bringing awareness to our habits while developing new, tested and proven successful habits. These changes will rock your world if you're unsure of how to get your business growing, if you're desk looks like a mess of papers and business cards, if you're losing time finding information about clients, potential clients and bills that should have been paid already. Wasting time, energy and money can stop now when you learn the simple and effective habits of Mindful Business Practices. I did it - so can you! We really want you to feel the rush of success - to experience the thrill of reaching your goals and enjoying the fruits of your labours. Get started on this 5-day min-E-course that will be sent directly to your inbox and enjoy the journey to your success. We're offering this FREE to help you start this journey and begin to feel the joy that is yours to have. Over 5 days we'll cover a few key areas to bring you back to basics and provide you with the step-by-step habits and organizational techniques that absolutely differentiate successful business's from the amateur struggling business or practice. There's a Chair Massage Biz Webinar on the subject called "Back to Basics Webinar  Surviving the Recession, Boosting Your Massage Business, and Finding More Time for Yourself". Please join us for the live Webinar, or the replay if after August 2011. The webinar is FREE! Click here to register or view the replay and learn about a few of the most effective habits we were never taught, and how to change your habits into ones that bring you success.